The 73,192 GRT Sovereign of the Seas was the first “megaliner”—a cruise ship designed to be a floating resort. Today, when compared to a generation of 21st century floating office blocks, Sovereign of the Seas can be viewed as a relatively small cruise ship. As she entered service, Sovereign of the Seas was 880 feet long and 106 feet at beam. She was capable of carrying 2,850 passengers. A set of four nine-cylinder diesel-engines could power her through the sea at a speed of 21.5 knots. Such speed was rarely necessary, however. For most of her Royal Caribbean career, Sovereign of the Seas was assigned to dreary three- and four-day cruises between Florida and Bahamian ports. Despite her size, Sovereign of the Sea arrived as a relatively attractive ship, featuring a graceful bow and generally trim lines that helped belie her hulk. 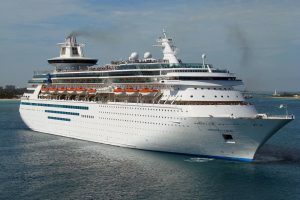 In many respects, Sovereign of the Seas and her sister ships, Monarch of the Seas and Majesty of the Seas, can be regarded as some of the last ships built for a mass market cruise line to retain some of the look and feel of a traditional ocean liner/cruise ship. Sovereign of the Seas’ interior featured include a multi-deck atrium lobby (the Centrum), and a funnel-mounted top-deck Viking Crown Lounge. The ship offers five restaurants, nine bars, spa, four pools and a casino. In November 2008 Sovereign of the Seas was refurbished and transferred to the fleet of Pullmantur Cruises. Renamed Sovereign. she now runs Mediterranean round-trip cruises from Barcelona, Palma de Mallorca, Malaga and Rome. How much longer Sovereign will remain at sea is anyone’s guess. She’s getting older, and may soon become uneconomical to run.